Diego Forlan – Deadly Striker or Donkey? Diego Forlan is wanted by Tottenham. The 31-year-old Uruguayan striker has been one of the stars of the World Cup in South Africa and Tottenham manager Harry Redknapp rates him highly. Atletico Madrid relied heavily on Forlan in their Europa League triumph and he scored twice in the final as they beat Fulham. But the stumbling block could be Forlan’s age – and the price that Atletico will demand. They will want in excess of £12million, while Spurs would not be prepared to go higher than £8.5m. But Redknapp feels a player of his experience will be vital as Spurs go for the Champions League. Now forgive me here but when Harry said he wanted that 1 special player this summer I really pray to god he didn’t mean Diego Forlan. I can’t deny that Forlan in Spain is not the same Forlan that played in England but I remember Savo Milosovic in the 90s going to Spain and being top scorer after not really impressing in England, so what makes Forlan any different?. My personal opinion on this subject is that I hope Harry is having a laugh here, I just think the style of Spanish football helps Forlan and his game. I think if he were to come back to the Premiership he would not be as deadly but go back to being that donkey we all remember from his Man Utd days. We then move on to the price, £12mil for a player of 31 and which in 2 years will be worthless. It will be a pricey gamble because if he does flop at Spurs then nobody in their right minds is going to stump up anywhere near that amount for a 31 year old flop. The one thing I admire about Daniel Levy is that he is a good business man when it comes to deals and usually buys players of younger age who can be sold on in the future. My only worry here is the persuasive power of Harry, especially now we have secured 4th place in the Premier League. I really hope this is a nasty rumor that just won’t go away because for £12millon we could get so much more for our money than Diego Forlan, however this is just my opinion on Forlan and I will not start doutbing Harry after what he has done for the club, so god forbid if he really wants to sign Diego Forlan then as much as that pains me, he has my full support. 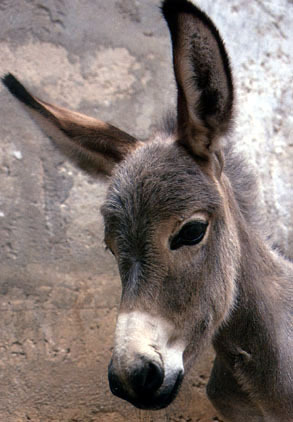 cute looking donkey though lol….. I think Forlan can do a great job over here. We’re a passing team, moreso than United. United usually have someone on the wing running with the ball the entire time before crossing. Nani, Giggs and Ronaldo ran almost all the time with the ball, making them key players in United’s attack. Forlan doesn’t work like that. He looks like a player who would do damage the moment he receives a pass from Modric or Lennon. How wonderful would that look!? I can imagine it now and am drooling lol.